The Timacuan Comunity is home to the Timacuan Golf & Country Club, which is an 18 hole championship course that is rated one of the best in Florida. Located just off Rinehart with very quick and easy access to the I-4, Seminole Town Centre, Lake Mary Sports Complex, Heathrow Business Parks and everything Lake Mary. The lush landscape in Timacuan features beautiful winding roads that wrap the golf course, Country Club and hilly greenspace areas. Timacuan is a planned community with several subdivisions. There are 490 homes that were built between 1988-2000 by Ryland, David Weekley, and MI Homes as well as many custom homes. 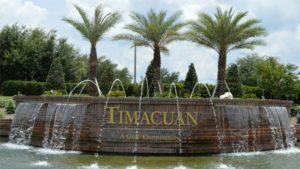 Timacuan homes average between 2,000-3,500 sq ft with values in the mid $300’s to high $500’s. For more information visit Timacuan HOA website. Visit the Timacuan Golf and Country Club website for more golf info.